The links on this page are to sites that I personally have used, found to be very usefull and can highly recommend. This is Az Mohammed's fine site which covers an essential guide to eating, drinking and clubbing in the North East.A great guide to pubs, clubs and eating places in the North East. This is Al Redpath's Fantastic Tyneside site - full of information on both Newcastle and Tyneside. Well kept up to date by Al, who runs the site from Canada. This is Mike Ellison's Fine Hebburn Site - very informative, giving the hisitory of the Town of Hebburn together with photographs of then and now. This is my main photographic archive, containing well over 6,000 photographs of the Tyneside and Northumbria area's. It also features photographs, new and old submitted by others to share. This is the BBC's North East Web Site - full of news, information, competitions and many more features - well worth a visit to keep up to date with what is happening. This is Jeff and Margaret's hugely funny and yet informative site covering the North Shields area - another site that I often visit to read Jeff's low down on the news. A very informative web site operated by Trinity Mirror and replaces the former Evening Chronicle site. Great place for the latest North East news and also a great Geordie ex-pat section vontrolled by Chris Rooney. This link will take you to an absolute Treasure Trove of information covering Northumbria, Durham and Newcastle. A site administered by Brian Pears and what a fantastic job he does. Reuben Jamieson's Family History Home-page - a very interesting and vivid account of Reuben's very colouful and varied ancestory, including murder most foul!. This site gives live shots of two views from the Tyne Bridge - not quite streaming video, but shots taken at 5 second intervals. Good for the homesick Geordie. Cemeteries are a unique environment, they often contain a wealth of social and historical information as well as interesting sculpture, architecture and landscape design. A great site, administered by Steve Hughes representing a lively pub in Whitley Bay called The Fat Ox. I usually start off in here on a Friday night and can vouch for the good beer! This is how Andy describes his site - My site is dedicated primarily to the church of Jesus Christ, its history and presence in Tyneside and the rest of the world. 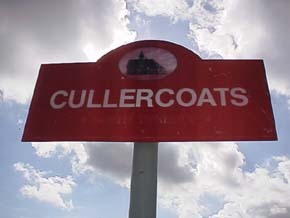 This is the web site of Cullercoats Village (between Whitley Bay and Tynemouth) and gives good local information. This is the Newcastle Community News site which whilst in hibernation, contains some rich local hisitory accounts. You can also join the Geordie Discussion List from there. This is Michael Southwick's site which covers his excellent publication, The North-Easterner, a guide to local and family history in the North East of England. This is a quarterly publication which is available directly from Michael. 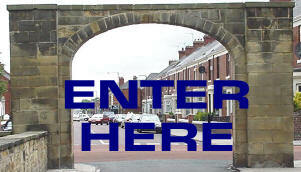 This is the Tynemouth Community Web Site and very informative. The author is John who writes "This site is my attempt to 'find a balance' between the possible futures of the Village at the Millennium and to show what the Village was like in the year 2000. It is a 'developing' site and is continually being updated (sometimes daily"
This is Frank Gillings famous Tynemouth Site which gives a whole host of information concerning the history of the village. Some great photographs and video of events both recent and old. Well worth a stroll through Franks nostaligic site. This is Simon Brunton's Family History Site. Dealing mainly with the Cullercoats Brunton's and their association with the Lisle's and the Donkins's amongst others. A Fine Geordie Web Site - even if I say so myself! The Waterford Arms at Seaton Sluice - Highly recommended for their restaurant which serves great seafood. The homepage of The Maling Collectors Society. For collectors of Maling Pottery, made in Newcastle upon Tyne, England. This is a link to Richards Church Albums a massive colelction of the photographs of Churches throughout the United Kingdom. A wonderful resource. Fancy an interesting cruise down the river Tyne from Newcastle to the Tyne Piers? Click on the icon for further details - an excellent way to spend a day out. I know, I've been on a trip!. This is the Whitley Bay Golf Club site - Fancy a round? This is Paul Perry's Hebburn web site which gives information on the Town and also details of Paul's books and massive photograph collection - including many of the Jarrow March.